As a huge fan of ‘The Good Life’ I’d always quite fancied the idea of keeping chickens. As with many of my dreams and fancies I didn’t think it would actually happen as I didn’t really have the time and energy. When two of my neighbours started chicken keeping and I was asked to look after theirs when they went on holiday I discovered that I loved it and actually it wasn’t as time consuming as I first thought. Even as a busy mum with young children and working part time I realised it was feasible. I loved the routine of feeding them every morning and collecting their fresh eggs. 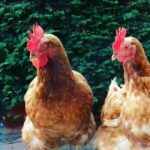 When I started researching the subject and found out that you could rehome battery chickens I knew straight away that was what I wanted to do. Although I know we live in such a wasteful society I was amazed that these lovely chickens are put down when they’ve served their purpose even if they are still healthy and laying eggs. After much deliberation, discussion and excitement we picked up our first four ex-batts on a rehoming day in Coventry in 2017. The first week or so there is quite a bit of pecking and plucking of feathers but this is only natural as the chickens establish a pecking order. Becky, Doris, Queenie and Rosalie soon settled in and much to our delight and surprise were laying eggs from day one. We were soon were in the routine of letting them out in the morning for their breakfast, filling up their water and feeding them corn in the evening and putting them in the coop before dark to keep them safe from predators. We also feed them food scraps like greens and bread crusts in the afternoon if there are any going spare. Mealworms make a tasty treat for them too. I often get asked how much time do you need day to day when keeping chickens and I think its not as much as people might think. Perhaps five minutes in the morning and then five minutes in the evening. You’ll need to clean up the poop a couple of times a week and every three months or so do a deep clean when you remove all the bedding and give the coop a good scrub. Do allow extra time though for any escapologist chickens like our lovely, late Becky who did like to fly the coop and escape into our next door neighbours garden. Oftentimes we could be seem shaking a tub of mealworms and calling her to come back. If that failed we’d have to scale the fence with a handful of mealworms or cheerios to tempt her home. Luckily we have a very nice, understanding neighbour! Without sounding like a crazy chicken lady they all do have different personalities and foibles. Daphne our favourite chicken thinks she is a human and would live in our kitchen if she could. She can often be heard pecking on our kitchen door to be let in. She loves cuddles and is right at home with people. 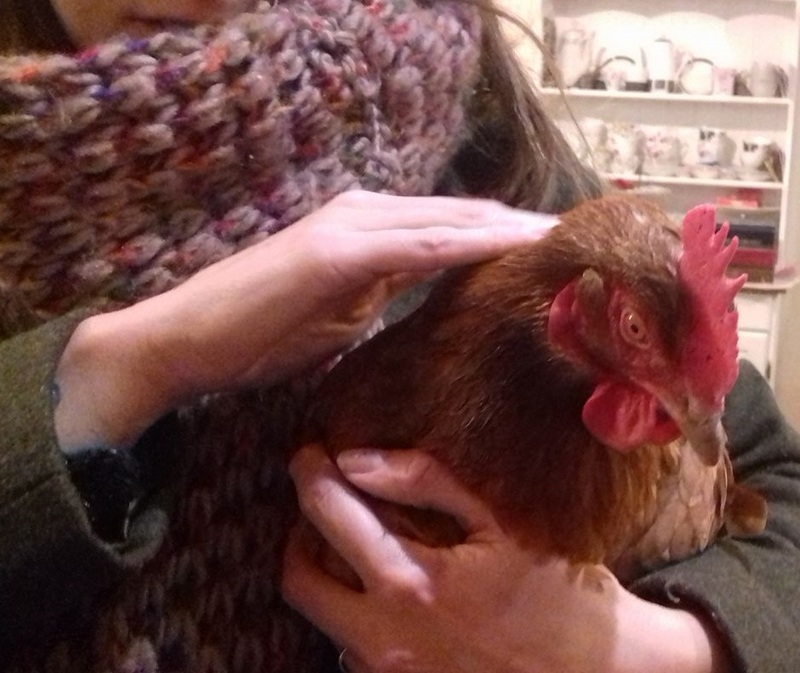 In contast poor Hetty Feather, was found cowering in the barn traumatised at the last chicken rehoming we attended. She will not be picked up and doesn’t particularly likes humans. In the first week she was with us she even ran away from a bumble bee (bless her). Since rehoming though she has put on weight and at least doesn’t cower at the sight of humans anymore. She is still bottom of the pecking order and is always the last chicken to eat from the feeder but at least she’s not bullied anymore and gets to enjoy the fresh air and dust baths in her retirement. If you are thinking of keeping chickens rehoming ex-batteries is definitely the way to go. They will all have had their vaccinations and on average be about 18 months old. They make excellent pets and you’ll never be short of people to look after them when you go on holiday. In the first week of their retirement you will need to provide bowls and water separately for each chicken as they establish the pecking order. Providing only one may mean the top chickens will be the only ones eating and drinking. As they have spent their life indoors in a small space you will need to help them climb up into their coop and sometimes put them in if it rains or snows as they wont have experienced the outdoors or any kind of weather before. If you already have chickens and are introducing ex-batts to an existing flock it is best to keep them separate in the daytime for a few weeks so they get used to each other. They should be ok at night to share the coop but again there will be pecking and bullying whilst a new pecking order is established. If you do fancy rescuing some chickens in need, it is such a rewarding hobby and there’s nothing better that helping a chicken enjoy a leisurely, well earned retirement pecking around in your garden and enjoying the fresh air.The British Hen Welfare Trust is the biggest charity in the UK rehoming tens of thousands of chickens each year along with Fresh Start For Hens. Its worth keeping an eye on their websites for rehoming dates and comprehensive information on how to look after rescue chickens.